We interrupt our indoor garden coverage with some thoughts on outdoor gardens. I've mentioned a number of times how, while I love indoor gardening, one day I hope to do as I did in my childhood and plant a victory garden. As much as I love the handful of tomatoes I can get from my AeroGarden, I really miss the bushels and bushels of tomatoes I used to harvest when I was a kid in my parent's house. 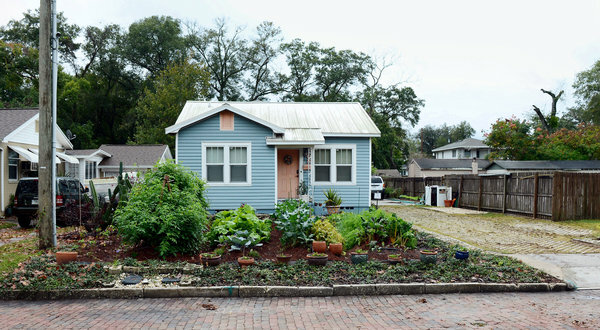 There's a couple in Orlando, Florida who planted a garden in their front yard. It's not even a bad looking garden. On this garden, Jason Helvenson grows carrots, bok choy, kale, and dozens of other fresh vegetables. At a time when food prices are rising and the hardworking family farmers that used to be the backbone of the United States are going out of business and replaced by giant conglomerates, it's wonderful to see Mr. Helvenson and his wife Jennifer taking the initiative to learn this important skill. Heaven forbid, if there's a crisis that disrupts the food chain, in their own little way Jason and Jennifer will have food to sustain their family and even neighbors. In the meantime, they're helping the environment, getting great exercise, eating healthy, saving money, and having fun. But of course, the government of the city of Orlando doesn't like this. Evidently they passed a law saying that front lawns can only contain grass. Why such a ridiculous law is on the books is anyone's guess, but this is what happens when government gets out of control and pass law after law after law. Ironically, those we elect to preserve our freedoms are the same ones who pass more and more laws restricting them. Don't get me wrong, I'm not one of those anarchists who thing all government is bad--I appreciate things like National Parks, food safety laws, libraries, and stuff like that. But things like this go way too far. Evidently, someone ratted out the Helvensons, and law enforcement came in and said that if they do not uproot their garden, they face a penalty of $500 a day until they do. To their credit, the Helvensons are not taking this sitting down. They started a Web site called Patriot-Gardens.com where they tell their story, as well as help educate people about the benefits of gardening. In a generous and clever little bit of civil disobedience, hey even have set up a form you can fill out to receive your own seeds and lawn sign that reads "Hands off our food!". What can you do? The first thing is to visit their Facebook page and show your support. You can request one of their lawn signs and plant it in your front yard if you have one. And if you live in Orlando or one of the other localities that are passing laws preventing people from planting gardens, learn the name of your local government officials and tell them flat out that if they pass dumb laws like this, you'll pass on them next November. It's funny that this story has appeared on both the New York Times and the Drudge Report in the last few days. I think it's because there are things here that transcend politics. The ability to plant a garden is something that has been part of our human experience since the beginning. And perhaps in more ways than any other it symbolizes the American ideals of hard work, perseverance, and literally reaping what you so. Do what you can to make sure a couple of dumb politicians don't take those basic freedoms away from us.